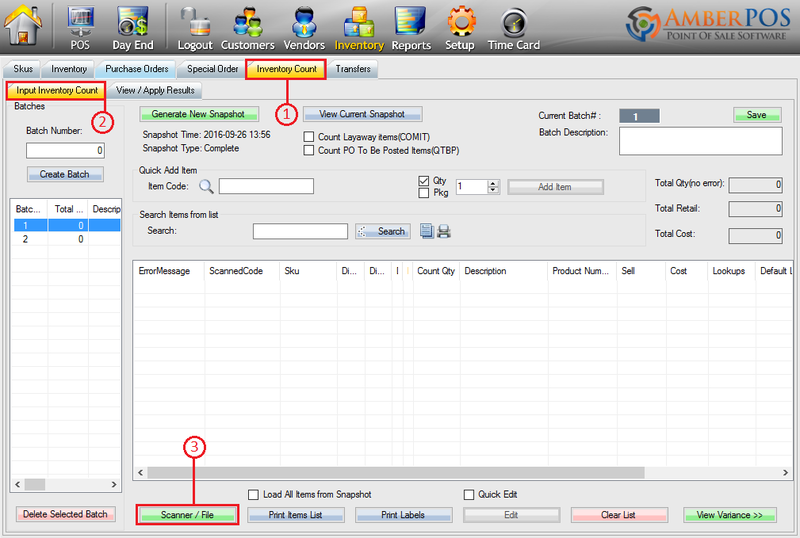 Downloading a SKU List from a Scanner to AmberPOS – Pacific Amber Technologies Inc.
1. To upload your Skulist from any inventory count terminal scanner, first Login to AmberPOS and access the inventory menu. Step 1: Select the tab near the top of the screen. Step 2: Ensure that the tab is selected below the inventory count tab. Step 3: Select to export your Skulist to your terminal scanner. 3. Select from the window that appears. 5. Before you can begin scanning for another batch, you must first Clear Scan List From Scanner in order to prevent the batches from overlapping in your scanner during the next scanning session. Make sure your Scan List is uploaded to your computer first, or else your data will be permanently deleted. After clearing the scan list you will have to turn AmberCount off and on again before you can resume scanning items.